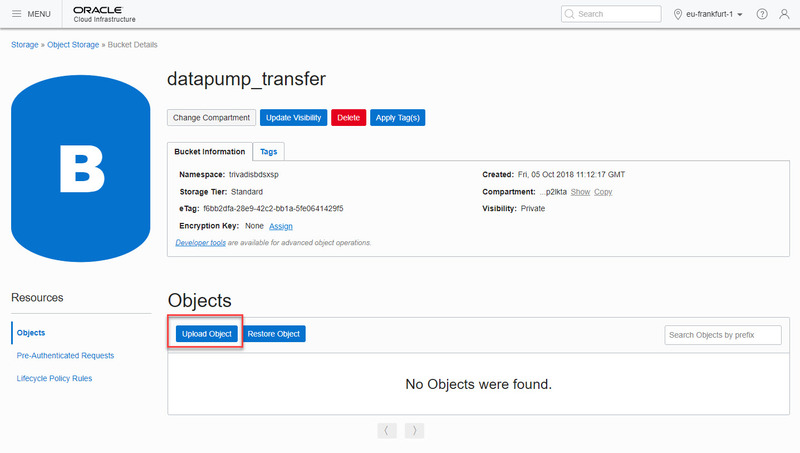 In this blog post serie which has three parts, I want to describe how data will be uploaded from an on-premises environment into the Oracle Autonomous Transaction Processing database using Oracle Data Pump. Oracle recommends the following settings for the Oracle Data Pump export job. If you use already an 18c database, you have to set the version parameter to 12.2 to avoid this error during ATP import process: ORA-39358: Export dump file version 18.0.0 not compatible with target version 12.2.0. The export dump file has to be transferred into the Oracle Cloud Object Storage for later usage. First we have to create an Object Storage Bucket. 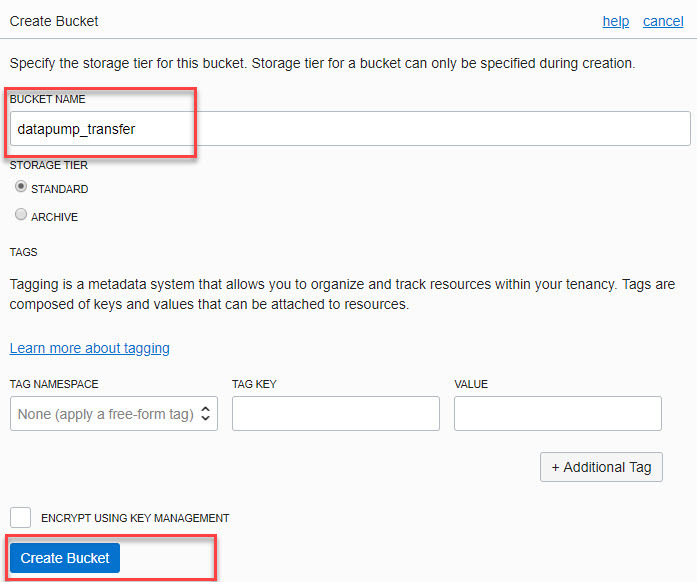 Login into Object Storage menu and click on the “Create Bucket” button. Enter a Bucket Name and click on “Create Bucket”. Enter the new created bucket. Click on the bucket name link or the “three bullets” on the right side to view the details. 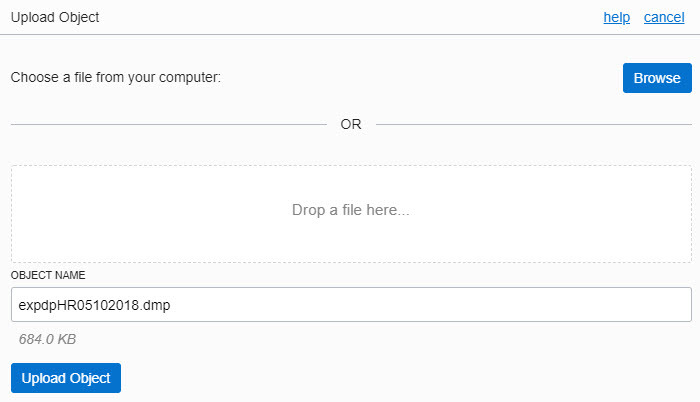 Upload the export dump file, click on “Upload Object”. 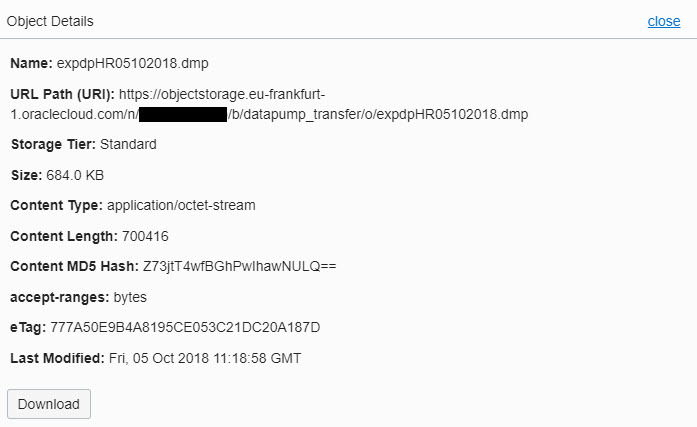 “Browse” local for the Oracle Data Pump export file and click on “Upload Object”. Click on object “Details” to verify the object on the Object Storage. Note the URL. The URL will be used later for the import process. Upload objects into the Oracle Cloud Object Storage is very easy. If you don’t want to use the browser functionality, there are other possibilities to upload files like the API. Now the export dump file is ready to import into the Autonomous Transaction Processing Database.